In Rapid Sequence Intubation(RSI), there is that period of apnoea that occurs following delivery of paralytics and prior to attempting laryngoscopy and intubation. It’s a period of 40 to 50 seconds, before we attempt to do anything. “Don’t bag!” we often scold. “It’ll fill the stomach and cause regurgitation and aspiration”…… In the background the patient’s saturations slowly drop, until a point where we have to bag valve mask(BVM). What we need for is a way to ventilate the patient through the apnoea period, especially those at high risk of desaturation, allowing more time with adequate saturations during the laryngoscopy phase of intubation. Is there a problem with using BVM? 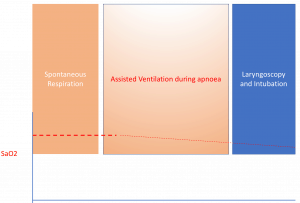 Grant et al(4) propose the VAPOX method: Ventilator Assisted Pre-Oxygenation. They use a Hamilton T1 Ventilator to do this, however the theory behind it is the same for any ventilator and some BiPAP machines can also be used. Ventilation is maintained until laryngoscopy is attempted. This is paper proposes the use of Pressure Controlled Ventilation. The benefit of pressure controlled ventilation is that we know with a degree of precision that this is the maximum pressure reached. Not only is it the maximum pressure that is reached with each breath, but that pressure is maintained throughout the whole breath, essentially maximising the tidal volume. Limiting the pressure means limiting the risk of high pressures being delivered, which may result in gastric distension which we know occurs at pressures greater than 15cm H2O(5). Ketamine was used to settle agitated or combative patients and apnoeic oxygenation by nasal prongs was provided at 15L/min. The facemark is held with a two-handed technique, incorporating a jaw thrust and ETCO2 is also provided. 8 cases were presented in this study with varying levels of consciousness ie GCS from 3 to 13 and reasons for intubation ranging from intracranial bleeds to drug induced psychosis; all with good results. 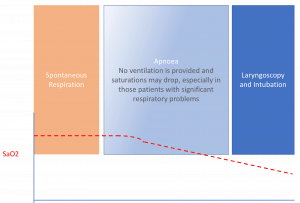 This method of apnoea ventilation is not for all patients and is suited to those patients with an increased risk of hypoxia during the apnoea phase or with severe acidosis. Inspiratory flow of 30L per min- this ensures slow delivery of breath. Can this be done using a Non-Invasive Ventilation apparatus like BiPAP? Absolutely. Set the inspiratory oxygen to 100% and the number of breaths delivered to 6-8 breaths per minute. Alter the PEEP as needed. We discussed the variation of PEEP in a previous blog on Non Invasive Ventilation. Effectively the EPAP or PEEP is the functional residual capacity and the difference between the IPAP and EPAP is the tidal volume. In simple terms; to increase oxygenation increase the PEEP, to blow off CO2 increase the tidal volume and even decrease the PEEP. I’ll speak more about this at EMCORE. Neilipovitz DT et al. No evidence for decreased risk of aspiration after rapid sequence induction. Can J Anaesth 2007;54:748-64. Grant S et al. Vebtilator-assited preoxygenation: Protocol for combining non-invasive ventilation and apneic oxygenation using a portable ventilator. Emerg. Med. Australas. 2016;28:67-72.